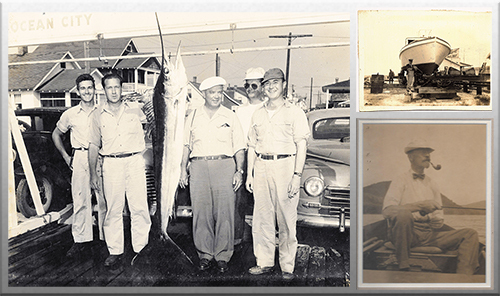 Where Did Blue Water Sportfishing Charters (BWSC) really come from? Who is the Mumford family who launched Blue Water Sportfishing Charters (BWSC)? The arrangement of family photo files from the 1850’s within the Mumford family had one thing in common. Water. Boats. Fishing rods and fish. Costa Rica and Pura Vida! Panama and foreign destinations with a charter fishing history. Brainstorming for a name for an international fishing vacation booking service kept coming back to all the places in the world the family had been. It always had “blue water” close by. Blue Water Sportfishing Charters (BWSC) was created to make all your trip plans easier and the trip an adventure of a lifetime as all of ours were. Blue Water Sportfishing Charters (BWSC) is owned by Glen & Cindy Mumford and managed by Cindy and their daughter Kelly Curcio. Glen was a USCG licensed captain for over 30 years and traveled to many foreign locations to fish his boat owners and friends. Daughter Kelly and son John were on boats from the time they could walk and began fishing. Cindy was on the Board of Directors and tournament director for the Stuart Sailfish Club for over 15 years. Kelly has been in the travel business for many years helping with dream vacations. The family has lived in a service oriented marine environment all their lives and still today they are at work on or near “Blue Water”. For booking fishing vacations, dealing with Cindy and Kelly will be like dealing with a family member that “has been there already”. It is all about a seamless process to get you on board and back home with memories for a lifetime. As a newsletter subscriber you’ll get access to last minute deals and special offers from the hottest sportfish destinations on the planet!